Natural selection has becomeunnatural. Having dealt with the vicious murder of his wife, Edward Caine takeshis rightful place as a One-Percenter, eliminating those not fit for the humanrace. He must fight his instinct to use his role for revenge; he is after thosewho live on only because of money and medicine. The weak-gened are not fit to breed, and it’sthe job of Edward and his brethren to see that they don’t. But can he finishthe job before his own mind betrays him? He is an agent of the Earth. He is aOne-Percenter. Thanks to the author for sending me a copy of this book to review. BeforeI start this review, I should explain that I’m a sucker for a good mind game or psychological thriller. Ienjoy being toyed with. I like the books and movies that really get into my psycheand make me wonder what is reality and really stun me with the answer. I likejourneys into someone’s mind and their skewed perceptions. That’s probably whyI loved this book. It got into my head and toyed with my perceptions and I lovethat. I read it in one day. With anewborn, that’s quite a feat and should say something about my experience rightthere. The One Percenters is a book that some individualsmight feel uncomfortable about from the start, as it forces the reader toexperience events from the perspective of a killer. While this may beoff-putting to some, the sequence of events and the way in which the story isbeing told is so absorbing that it will be easy to overlook. Furthermore, thisbook isn’t that long, which forces events to happen at a quick pace and may beread rather quickly. Podgursky’swriting really should be highlighted. His first-person style is unique andalmost conversational rather than literary. For example, I could almost hearEd’s (the protagonist) voice as he was telling his story. While aconversational style of writing takes time to get used to, Podgursky’s writingis stunning and will easily wrap around the reader and pull them in. There aremany memorable lines and plenty of stylistic “wow’s” in The One Percenters. While Podgursky can wax overly philosophical onoccasion, it probably won’t hinder the reader’s enjoyment of the book at all. Infact, I read this book as much to enjoy his writing style as for the story. The One Percenters isn’t quitespeculative fiction, nor is it all the way thriller or pure fiction though it is completely psychological. It doesn’t seem to fully fit comfortably anywhere in particular and will interest readers of many different genres. However, this bookwill mostly appeal to readers who enjoy having their minds toyed with. Nothingis really as it seems. While it was fairly obvious that I was reading anincredibly interesting story told by a mentally damaged man, the ending isn’twhat you’d expect or predict it to be. Podgurskydoes excellent job writing from the perspective of a psycho. In fact, duringmuch of the book I was aware of the fact that the protagonist was probablyinsane, but I found myself second-guessing that and wondering, “what if” quitefrequently, which is a real accomplishment for the author. To portray asomewhat insane character, the protagonist can ramble, or backtracks in hisstory. During the beginning of the book this happens quite frequently, but asmore and more of the plot and the character and his various beliefs and currentsituation is revealed, it becomes obvious that Podgursky inserts this somewhatawkward backtracking and a few odd side-stories to portray the character’smental state. As the book progresses, they become far less awkward as thereader becomes more in tune with the mind of the protagonist and the overallflow of the book. Onepoint many readers may struggle with when reading The One Percenters is that the protagonist, Ed, can be hard torelate to, completely understand or sympathize with, as I’m sure most peoplesuffering from various forms of psychosis on such a grand level would be. WhileI don’t believe the reader is really supposed to completely sympathize withhim, some individuals will feel put off by that aspect of the book, as it mightcause them to feel separated from the overall work. Despite the fact thatreaders may be put off by this, I feel that the author was staying incrediblytrue to the character and his situation by writing him in such a way. The One Percenters is an incrediblyquick read, but despite that many readers may find it challenging to getthrough due to the fact that it is an interesting and detailed journey throughthe mind of a seriously disturbed individual. Podgursky wrote a book thatreally toys with the reader’s mind. His writing is the strongest point of thiswork. It’s conversational in tone but incredibly memorable due to its raw andatmospheric qualities. The protagonist is very well done, but can be hard torelate to and disturbing to read about. 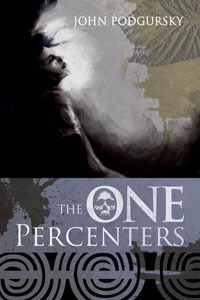 TheOne Percenters doesn’t quite fit in any genre, and because of this it willappeal to a wide range of readers but readers who enjoy psychological games will probably enjoy this the most. While itshould be fairly obvious that this book really wowed me, it did have issues.Podgursky waxes overly philosophical on occasion and the backtracking at thebeginning of the book can be slightly frustrating. Despite this, The One Percenters is well worthreading. Podgursky is a very exciting author and I will wait anxiously to seewhat he comes up with next.